The wood bison is a subspecies of the North American Bison and is only found in Canada. It differs from the other North American subspecies (the Plains bison) in many ways. It is heavier and the highest point is well ahead of its front legs, while the Plains bison's highest point is directly above the front legs. The wood bison can weigh over 1950 lb making it the largest mammal in North America. Both the male and female have short black horns, but the female's horns are straight and the male horns curve slightly inward. 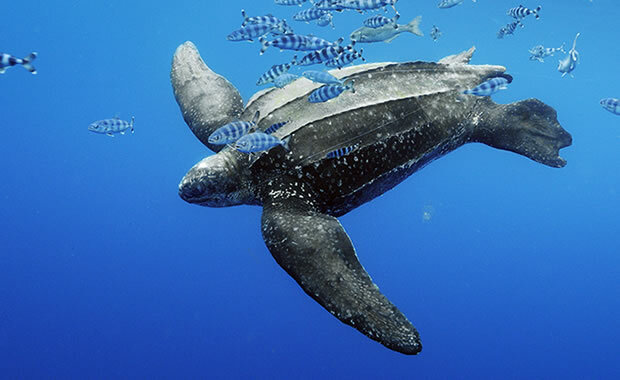 Males are larger than females and can reach 12.5 feet in length and around 5.9 feet in height. Bison are social animals and can be found in small herds year-round. In the summer, bison can be found in small willow pastures and uplands where they feed on sedges, forbes, and willows. In the winter, they move to frozen wet sedge meadows and lakeshores where they feed on sedges. In the fall, they can be found in the forest where they feed on lichens. Females give birth to two calves usually within a span of three years. The calves remain dependent on the mother for seven months. Historically the population for the wood bison was over 160,000. But due to hunting, the population was reduced to less than 250 by 1900. The bison population is also threatened by diseases such as tuberculosis and anthrax which have become common in bison herds. But bison populations have recovered since the 1920s to a total population of 9000 due to conservation efforts by Canadian conservationists. Copyright Notice: This article is licensed under the GNU Free Documentation License. It uses material from the Wikipedia article "American bison". Glenn, C. R. 2006. 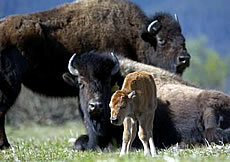 "Earth's Endangered Creatures - American Bison Facts" (Online). Accessed 4/21/2019 at http://earthsendangered.com/profile.asp?sp=34&ID=9. Need more American Bison facts?